I am not sure what I was thinking of when I decided to make an ice cream using pickled ginger. I had made my own pickled ginger to use up some fresh ginger before it went to waste and as I was on an ice cream making mission, the next logical progression in my thought pattern was to make an ice cream flavoured with pickled ginger. 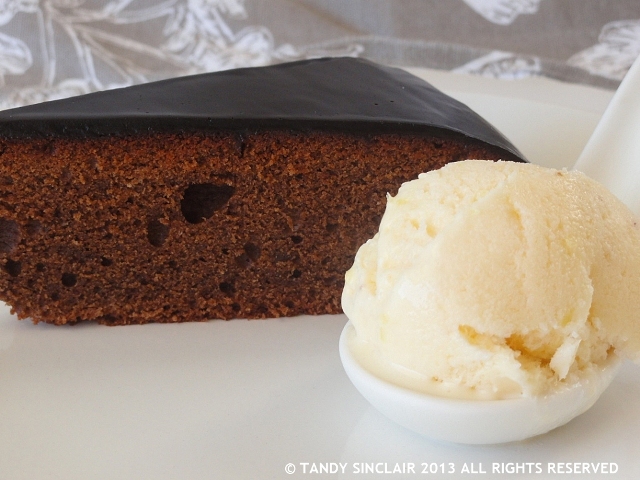 Surprisingly, the ginger taste is quite refreshing and when served with a chocolate based cake, truly amazing. If you don’t want to make pickled ginger for ice cream, do make it to go with your next sushi or fish meal – it is so much better than the store bought variety. what is the most unusual ice cream flavour you have tried? What an interesting flavor for ice cream! Tandy, just letting you know that your link to Food on Friday: Soup was featured in my Need Some Inspiration? Series today. Hope you have a nice week. I love the sound of it, but then I recently ate blue cheese ice cream which I adored! Wow, Tandy! This sounds interesting! We have a shop here that makes black licorice ice cream which I really enjoy. I am a HUGE pickled ginger fan so I definitely need to try this!! My favorite weird ice cream flavor is a thai basil flavor I made a few years ago! I’ve had ginger and lime lassis is India – fresh and light and refreshing, and yes tasty too! I should try a lime and ginger sorbet! Hi, Tandy, this wonderful recipe has caught my eye! I love ginger in all forms and when I have any left I simply stick it in a pot and let nature do all the keeping! Please let me know once you have made this what you think of the flavour!